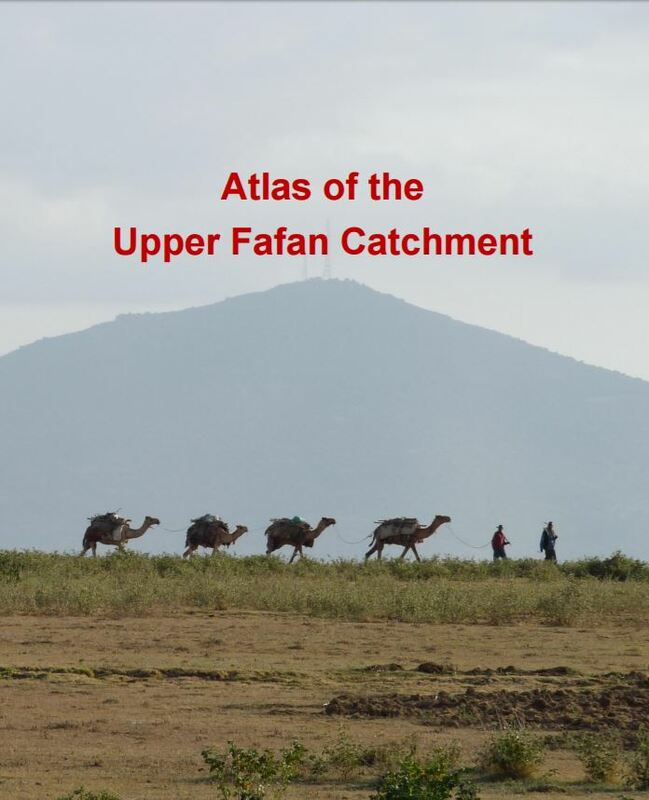 Wetlands International and partners working in the Somali Regional State of Ethiopia published the Atlas of the Upper Fafan Catchment. The Atlas consists of a series of vegetation cover and water resource maps over time. The resulting analysis and conclusions provide a roadmap for interventions leading to sustainable natural resource management and reduction of risks for droughts and flash floods in this disaster prone region. This novel approach is replicable in other catchments facing severe environmental degradation. The Upper Fafan Catchment in the Somali Regional State of north-eastern Ethiopia covers 3709 square kilometres. Rural communities here depend heavily on natural resources for their livelihoods; hence, a lack of proper management of the environment is a serious problem. Ecosystems are degrading at an alarming rate, mainly due to the loss of vegetation caused by overgrazing and deforestation. Extreme weather events are also increasing, and the region has suffered through years of low rainfall and a punishing drought. Using the Atlas* as a roadmap, Wetlands International and partners are piloting efforts to improve food and water security and disaster risk reduction. Together with the Manual for Implementation and accompanying case studies and suitability maps, we are working with local governments and communities to address the underlying problems that are degrading the landscape and causing disasters. Hazards (heavy or little rainfall, for example) are a given. Disasters, such as droughts, floods and famine, can be mitigated. Building resilience reduces the frequency of disasters and limits their impact, hence reducing the dependency on aid and supporting sustainable development. Resilience can be built through ecosystem based adaptation and ecosystem restoration, so that ecosystem services, such as water retention, nutrient cycles and biodiversity, are protected and recovered. Biophysical characteristics determine to a large extent the challenges and opportunities. Hence the suitability of interventions is strongly linked to landscape characteristics. Fact-based decision making implies the identification of challenges, opportunities and target priority areas, in such way that the larger landscape profits from investments. Proper assessments, for example, inform where the potential for water abstractions is highest and how to effectively combat invasive species. Following this line of thought, this Atlas runs from the factual presentation of the landscape characteristics and the description of challenges towards the identification of opportunities. This Atlas can be used as a base for Integrated Water and Resources Management, Catchment Management Plans and Land Use Planning. The problem analysis, based on the outcomes of the first stakeholder workshop. Cause-effect chains are key to understanding the problem. Hazards, such as heavy or lack of rainfall, become disasters due to severe ecosystem degradation. Failing natural resources management (NRM) was identified as the core problem. Climate conditions contribute to the challenges, but are not the major problem. As shown in the flowchart below, failing NRM is (at least in part) a consequence of contextual changes. Population growth and sedentarisation, for example, are contributing to the problem to the weakening of management practices. At the other end of the spectrum are the disasters. Solutions such as early warning systems, stocking and large-scale infrastructure, are important. When floods, droughts and famines are a fact then only emergency aid can help. These measures do, howev- er, have a very limited impact in the long-term. Overview of the problem analysis from page 7 of the full text. The assessments in this Atlas are anchored to the Ecosystem based Adaptation Approach. The EbA approach informs selection, design and siting of interventions. A good understanding of the landscape characteristics is, therefore, a priority concern. The assessments started with a review of readily available reports and data and pre- paratory GIS-analyses. These preliminary results provided a basic understanding of the biophysical and socio-economic context. Consecutive analyses of satellite imagery and field data collection were used to verify and validate the first results and fill data gaps. Data collection in the field was organised along focus group discussions, interviews with key informants, surveys and field trips. Feedback loops and iterations were built into the analysis process to ensure that the required level of detail was achieved and that no elements were over-looked. After refining and updating the results, the find- ings were discussed with local experts and stakeholders. The resilience of the Upper Fafan landscape is low and further decreasing. In 32% of the project area a decrease in vegetation cover was observed between 2000 and 2012. Degradation results in erosion, loss of soil qualities, widespread presence of invasive species, deregulation of wetlands’ functioning and changes in microclimatic conditions, and hence in a loss of resilience. Overgrazing, deforestation and expansion of agriculture all contribute to the challenge. Droughts are not (solely) a climate phenomenon. Droughts occur more often and are more severe, but cannot be related to a decrease in rainfall trend. The impact of these periods of low rainfall, however, has increased. The capacity of the landscape to buffer water has been lost to degradation. Runoff rates increased reducing water availability in dry periods. Together with population growth and a higher demand for water this results in increasingly severe water, pasture and food shortages. Environmental degradation is strongly related to poor management practices, which in turn relate to a lack of knowledge, regulations and agreements. Communities are aware of the problems, but have limited knowledge on sustainable farming methods and soil and water conservation measures. Ecosystems and their provisioning, regulating, cultural and supporting services are being lost at an alarming rate. The water buffering function is decreasing, soil qualities being lost, rangeland production decreasing, and the availability of natural products such as wood, wild fruits and berries dropping. Natural resources management (NRM) systems are failing. Traditional NRM systems are weakening, while alternatives are not fully functional. Disaster risk reduction can best be achieved through integrated resilience building. Hazards are a given, but do not necessarily lead to disasters. Erratic rainfall, for example, cannot be avoided, but its effects can be mitigated. By implementing ecosystem restoration and management, stakeholders take control over the landscape and degradation can be reversed. Restoration of ecosystems is possible through improved land use, conservation of keyecosystems and recharge, retention and reuse measures. High potential to improve access, availability and quality of water. The water balance calculation indicates that large volumes of water are available periodically. These huge volumes indicate that water access is rather a problem of seasonality and lack of water harvesting and infrastructure, than insufficient rainfall and water resources. Win-Win: multiple opportunities to protect nature and develop alternative sources of income. Poster of resilience building projects and ecosystem restoration in Somali Regional State, Ethiopia - a full resolution version is available to download from the further resources section below. Impact at scale can only be achieved through the implementation of coherent and widespread interventions. It is recommended to start working towards integrated NRM, based on the Ecosystem based Adaptation approach. This approach should be based on factual knowledge, mobilize all stakeholders and be institutionalized as early as possible. Capacity building. To efficiently deploy the available resources, it is recommended to start with knowledge and capacity building on systems thinking, integrated NRM and Ecosystem based Adaptation. Visioning. To improve planning and coordination visioning will be important. Through multi-stakeholder participatory planning, community engagement and fact-based decision making goals and objectives should be defined, and priorities set. Multiplication and expansion. To create impact, widespread implementation of measures is needed and this can only be achieved if measures are implemented, maintained and replicated by the users of the landscape. Strengthening the enabling environment. There is a dire need for policy adjustments, regulatory measures, coordination and dialogue, and the integration of traditional management practices into governmental guidelines. Subsidiarity principle and democratic decision-making. Deal with problems at the most immediate level consistent with the solution. Selection and design of measures and expert involvement. Measures are most effective when hard and soft measures are combined. Figure 6.1 from page 56 of the Atlas: Women fetching water for domestic purposes. In the back, livestock, goats and sheep entering the pond. This Atlas was designed and edited by Reinier Visser, Mieke Hulshof and Yitbarek Tibe- be. The main authors are Reinier Visser, Mieke Hulshof, Yitbarek Tibebe, Lieselotte Tolk and Frank van Weert (Acacia Water and Wetlands International). Project lead: Acacia Water. Content, analysis and reporting: Wetlands International and Acacia Water. Map production: Acacia Water. Design and editing Atlas: Acacia Water. Review by all project partners. The program is funded by the Dutch Ministry of Foreign Affairs. Atlas of the Upper Fafan Catchment (2016) An assessment towards building resilience through ecosystem restoration in Somali Regional State, Ethiopia. Strengthening Community Resilience in Somali Region, Ethiopia (SCRSE), a Protracted Crisis, Horn of Africa Programme implemented by The Netherlands Red Cross, Ethiopian Red Cross Society, Wetlands International, the Red Cross/Red Crescent Climate Centre and the Dutch Ministry of Foreign Affairs with contributions from Acacia Water and HoAREC&N: Gouda, The Netherlands.